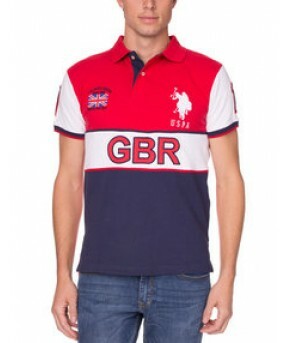 Show your enthusiasm and competitive spirit in our Team Great Britain polo shirt. A color-blocked front contrasts with the solid back, which has a large number one and "GBR" applique. Whether you're wearing this to the game or watching at home, this will be your go-to shirt. Collar with two-button contrast color front placket. Large stitched logo on upper front; number one on both sleeves. Number one appliqué, "GBR" appliqué on back.